BOND is the place for glamorous and sophisticated dining and cocktailing. 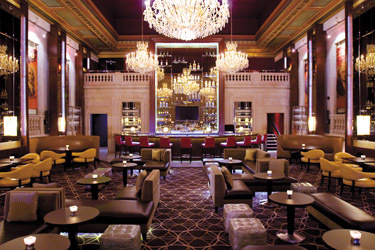 Located in the heart of Boston, BOND is situated inside The Langham, Boston. BOND is open seven days a week and offers gourmet sandwiches for lunch, metropolitan afternoon tea, small plates of global cuisine for dinner, and an evening of nightlife with custom-mixed music and drinks. Select a wine from the extensive wine list or sip on one of BOND's most distinctive cocktails.